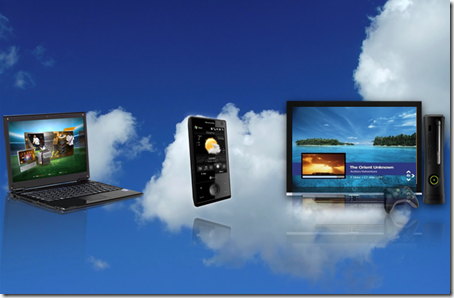 Home › Cloud › Where is my 3rd screen? Where is my 3rd screen? With MS using the new catch phrase ‘To the cloud’ and saying things like ‘three screens and the cloud’. You would think that they would consider their cross device support even if those devices are all Microsoft based ones. We all can see that they have the cloud sussed with their Azure platform and services based offerings and this excites me greatly and makes me wish that I can start thinking about those three screens. So the third screen is my TV right? How do I get to use my TV as the third screen well that would be with my Xbox surely. But do I really have to use XNA to realise this dream especially since I have all my design assets within XAML right now. There have been all sorts of rumours regarding SL on the Xbox without any sort of foundation or demonstration from MS.
For yesterdays Future of Silverlight Keynote I was hoping that we would see some more regarding the platforms that Microsoft are targeting specifically hoping that one of those would be the xBox. What I actually saw was how Silverlight Is concentrating on adding abilities that are mainly PC based along the lines of pInvoke and even remote control devices (surely this has been added because of a specific supplier request not because the public have asked). It is about time they made things clear so that they can either quash or realise my hopes.